...OF SPRING AND SUMMER...: FLOWERS by ingrid and titti - Tulip Day! FLOWERS by ingrid and titti - Tulip Day! 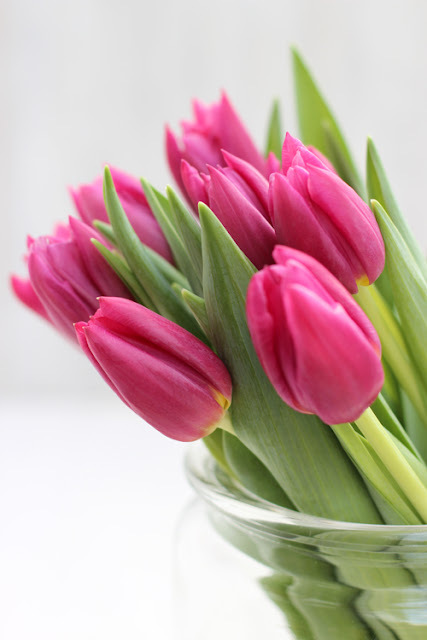 I've been doing tulips all week because of Tulip Week in Sweden and today on FLOWERS Titti and I are celebrating Tulip Day. 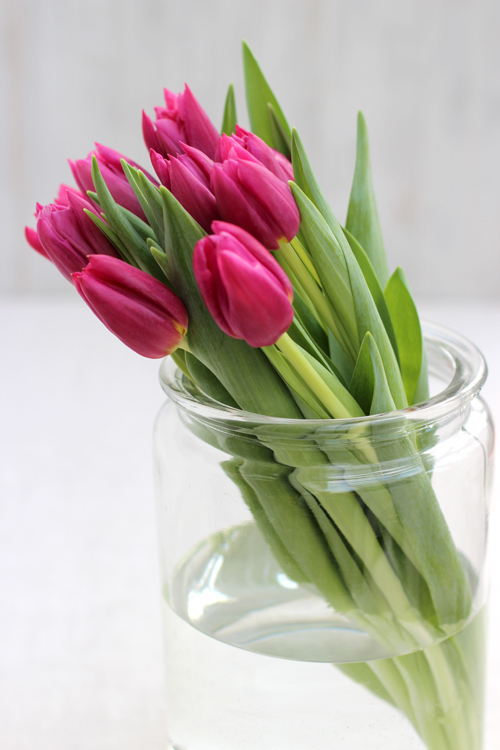 I'm showing three very simple and slightly different ways of arranging the same bunch of tulips in two vintage pickling jars. In the first one I have simply taken ten tulips of the same colour and I'm leaning them to one side of the large glass jar. You can do this with any bunch of flowers - it's a little bit of a more relaxed and contemporary way of displaying flowers. 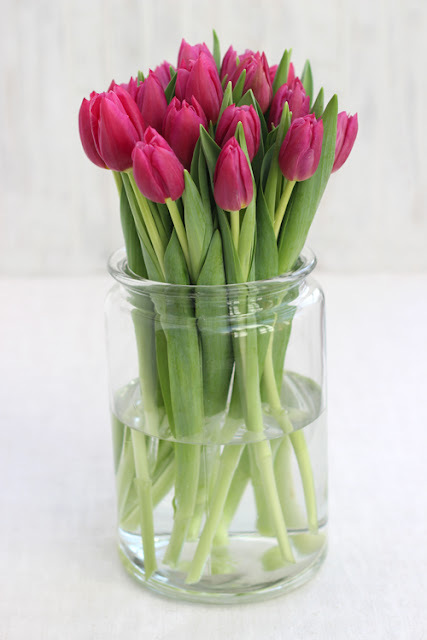 In the next one I have added another ten tulips - still of the same colour and I have packed them quite tightly into the pickling jar. I have left the ones in the middle slightly longer and the ones around the edges slightly shorter. I have also on purpose not made the flowers into a hand-tied bunch. 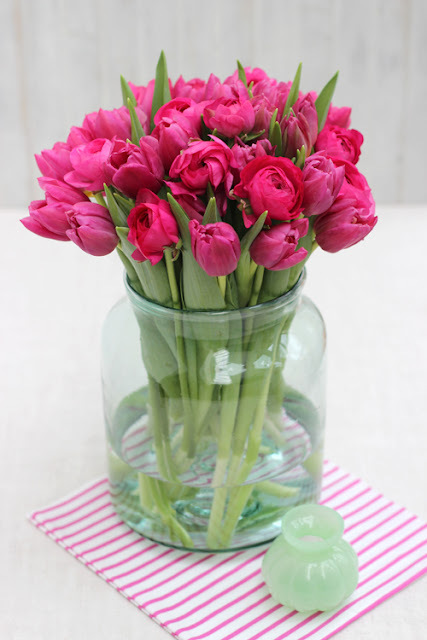 Instead the stems are a bit unruly in the bottom of the vase also giving it a more relaxed look. This is a good way to arrange tulips if you don't like the "wild" look - as the container keeps the flowers contained - even as they grow. In the last arrangement I have added a whole lot of Ranunculus in almost the same colour as the tulips. I first removed all the leaves so I only had the long stems to feed down among the tulips. 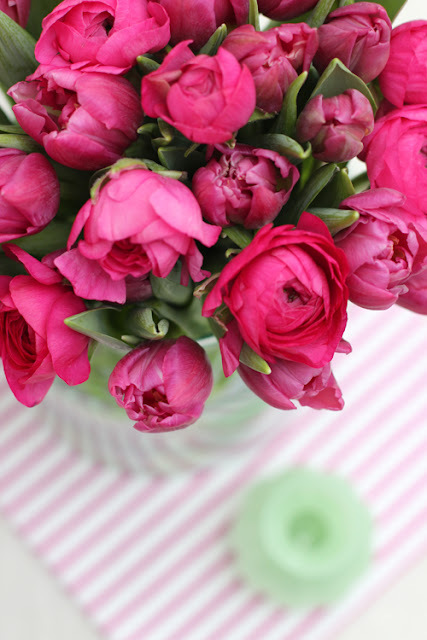 They are spread evenly throughout the tulips giving the bouquet a softer look with the rounder, frillier and multi-layered Ranunculus flowers. In this the last arrangement I have used a jar with a slightly wider and more squat shape and instead of clear glass this jar has a slightly green tinge to the glass picking up the colour of the leaves and stems. With the addition of a piece of fabric, that can be used as a tablecloth, that picks up the colour of the flowers and a little mini vase the arrangements are ready to be placed on any little table, sideboard or mantelpiece around your home. 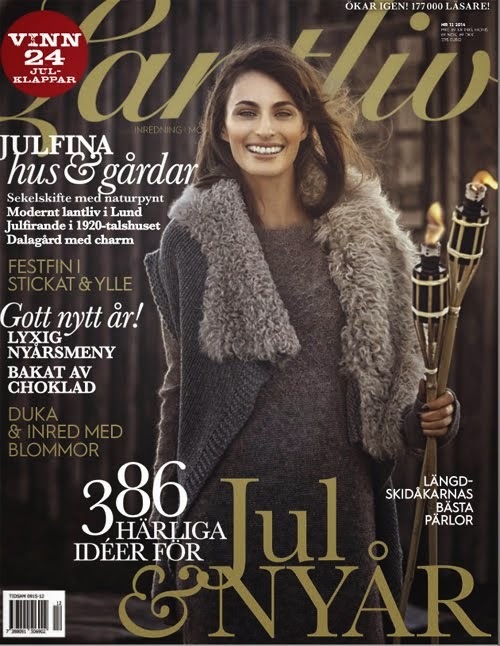 My Swedish collaborator Titti Malmberg over on HWIT BLOGG is also celebrating Tulip Day - so go over and have a look at her interpretation. Have a fabulous floral Friday and I will see you tomorrow again for Day 6 of Tulip Week. 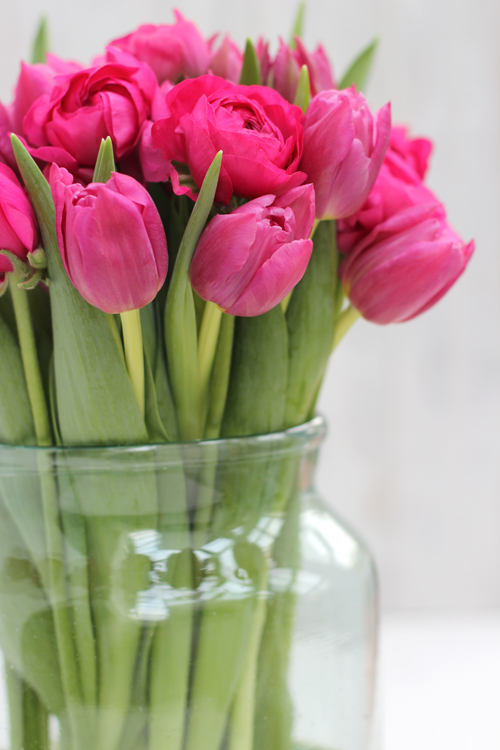 I'll be featuring a little bit about styling and decorating with tulips.